In contemporary Western society, there is a strong focus on how the body looks and performs, and whether it requires regulation. These powerful expectations impact on individual embodiment - the lived experience of having and being a body, including the internalisation and enactment of socially constructed norms (Kosut and Moore 2010; Shapiro 2015). 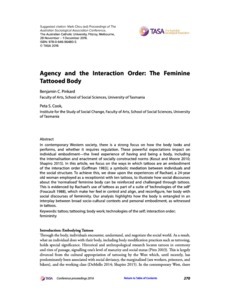 In this article, we focus on the ways in which tattoos are an embodiment of the interaction order (Goffman 1983); a symbolic mediation between individuals and the social structure. To achieve this, we draw upon the experiences of Rachael, a 24-year old woman employed as a receptionist with ten tattoos, to illustrate how social discourses about the ‘normalised’ feminine body can be reinforced and challenged through tattoos. This is evidenced by Rachael’s use of tattoos as part of a suite of ‘technologies of the self’ (Foucault 1988), which make her feel in control and align, and reconfigure, her body with social discourses of femininity. Our analysis highlights how the body is entangled in an interplay between broad socio-cultural contexts and personal embodiment, as witnessed in tattoos.